Modern gutter cleaning equipment has made it quicker and easier to keep your gutters clear of debris which can lead to blocked drains and leaking gutters. At Cardiff Window Cleaner Ltd we provide full inspection, cleaning and minor repairs to guttering, fascia & soffits. Latest vacuum technology to clear gutters. Reaches up to 52ft high. Eliminates the need for ladders and high access equipment when cleaning guttering. Operators work from safety of the ground. This method of gutter cleaning is environmentally friendly. Reduced disturbance and maintains privacy. Ladderless wireless camera survey inspections and recordings of gutter condition. Gutter repairs also carried out. 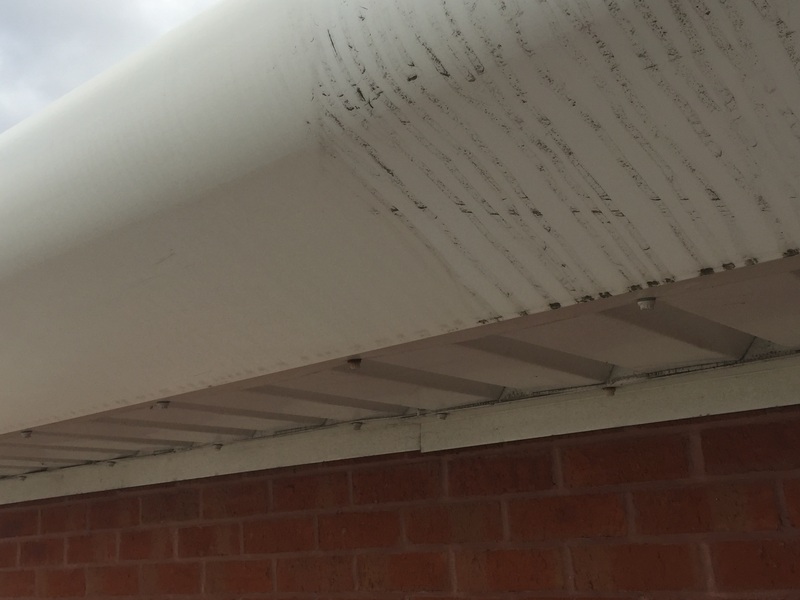 Gutter cleaning is a preventative maintenance which we recommend to be carried out annually. This prevents blockages backing up causing overspills, flooding and subsequent expensive damage to external and internal walls, decorations, furnishings and carpets. Our Gutter Vac and wireless camera survey system reaches heights of 52ft (4-5 floors). The Gutter Vac system is a self contained unit with 4200 watt motors producing exceptional suction. It remains the safest and most cost effective clearing method with better results. The same system has various attachments to reach and clean all kinds of situations including high level internal vacuum cleaning of beams, atria, RSJ’s and piping. ”Our professional vacuum system quickly and easily unblocks low level and high rise guttering and our unique separate jetting system attached to a power pole will make light work of any truly blocked down pipes. All work comes guaranteed. Insurance companies may decline to settle claims resulting from blocked or damaged guttering if it has not been properly maintained. For peace of mind contact Cardiff Window Cleaner Ltd today to request an inspection. If you are not sure whether your gutters need clearing, our wireless camera survey system can inspect and if requested record to Video an evaluation of the condition of your gutters. Prices for this service are based on a call out charge and a rate per hour spent thereafter. 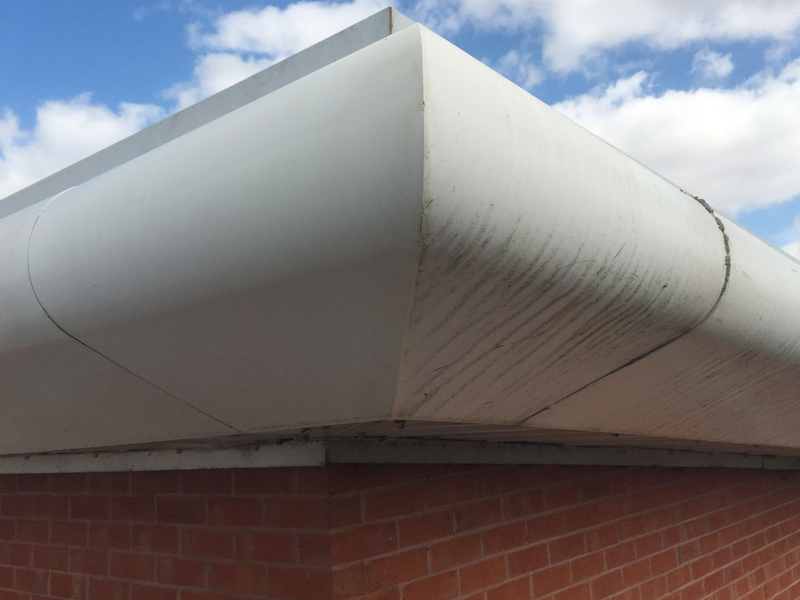 Our quotations for gutter or uPVC fascia cleaning are worked out by height and priced per meter (normally the distance between the gutters mounting brackets or the length along the base of the building can be measured). uPVC is one area that can be missed when considering carrying out a building clean but will have a drastic overall effect on the look of a building as it’s the finishing edges to a building. We are able to restore the plastic to like new in most cases. Removing green algae build up and other staining will help keep your building looking good as new.